Me at CODEX 7 2019. Wake Robin is one of the common names (others include ‘Stink Pot’ and ‘Stinkin' Willie’, my favorite) for the deep red trillium that grows in the North Country of New York State, US, in early spring and is the name I use for my studio. I’m Velma Bolyard and I began my working in textiles and making paper in the fiber art program at Buffalo State, before I landed in the western Adirondack Mountains of New York. I set up my paper and fiber studio, Wake Robin, in the North Country in the 1980's. I'm a weaver, spinner, papermaker, book and fiber artist. Currently I work with paper, making shifu (a spun and woven paper textile), botanical contact or eco printing on paper and textiles, and making artists' books. In 2016 I retired from teaching special education in public school. I am now teaching workshops/classes in shifu, hand papermaking, and book arts in North America, and Australia and at St Lawrence University in Canton, NY. I find that I respond deeply to this place I call home, exploring my connections and concerns for the land, animals, plants, and weather of this place. I’ve fallen deeply in love with this harsh, hard scrabble, beautiful land. I began dyeing with natural dyes long ago, after I became aware of the toxicity of the many then available chemical dyes. I began to hear of something called "compost dyeing" and decided I'd try it working with my land, cloth, and weather. (There was very little information then, despite the new internet, but the name for the process motivated me.) One autumn I wrapped a once burned and now rusty 55 gallon drum with a couple yards of natural-colored cotton muslin and let it sit in my yard for a month or so. I doused it daily with water and rolled it a quarter-turn. As some colors began to appear on the cloth I decided to feed it, adding water, sometimes vinegar, whey from yogurt or old milk, even beer if I didn't want to finish my supper libation. Welcome microorganisms began tinting the cloth and colors and patterns appeared. I removed the cloth once or twice, but continued to water and roll it. This cloth was made for a bookbinder friend, and it started me thinking of alternative ways of combining natural dyeing and books. I heard about a book called Eco Colour by India Flint and I sent away to Australia to buy it. Thus began my working with local plants, waters, and found metals for eco-printing. I had the opportunity to study with India, and learned to dye paper with Japanese traditional dyestuffs and methods with Tatiana Ginsburg. I began to experiment on my own papers, sometimes ruining handmade sheets until my hands learned how to handle dye bundles made of papers. Eco printing is now called contact or botanical or pressure printing, or a combination of those words. Catherine Michaelis has coined the phrase BoCo Printing, which I quite like. Below is a video of me unbundling the last sheet from a batch of Arches Text Wove half sheets. I’m working with large sheets in my kitchen sink, a barely workable space, making papers for my letterpress book November, A Map, an edition of 31. My daughter Hannah Stevens recorded me unbundling a large print on Arches Text Wove (Velin). I make paper, and for many years have specialized in making paper from indigenous plants. This big stack (about 10 inches or so) includes papers made from: slippery elm inner bark, day lily leaves, cotton linters, abaca, milkweed bast, hosta leaves, iris leaves, canada thistle seed heads, corn husks, rhubarb leaf stalks, wild clematis seed head papers. The golden papers are cotton rag, a bed sheet from a garage sale. By pulping cellulose cloth and making it into paper the story of that clothing which once intimately covered the owner’s skin, remains embedded in the page. In order, left to right: worked and inked (my walnut handmade ink) lokta (momogami), lokta and handspun wool singles, lokta, winter field retted milkweed papers, gramicci cotton climbing pants paper and the waistband "shibori" as cloth covering for a coptic bound book, and another piece of milkweed paper. Shifu is the Japanese art of spinning and weaving handmade paper into cloth. 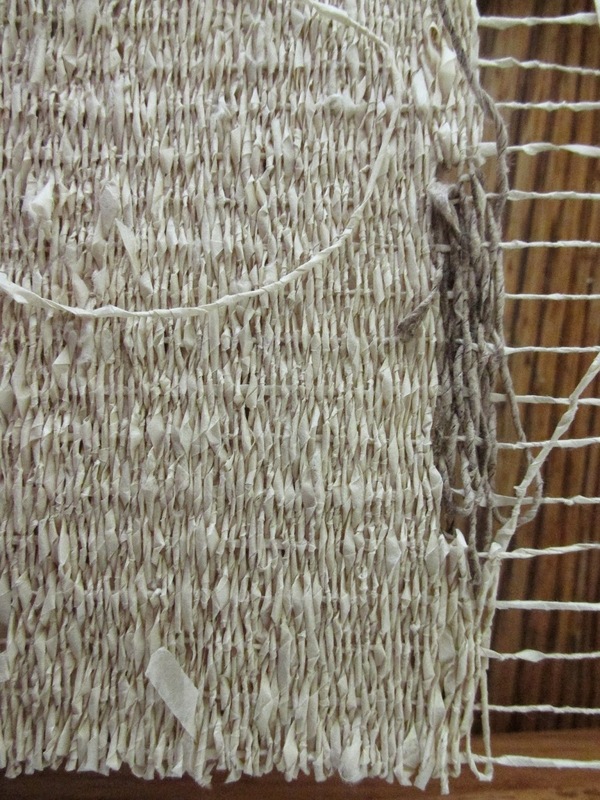 Shifu is made with at least one spun paper element, usually weft but sometimes both warp and weft. The other element (usually warp) is silk or cotton. Shifu is surprisingly light in weight, yet warm to the touch, and originally provided rural Japanese people with an alternative, locally sourced (homemade) and inexpensive, cloth. My idiosyncratic take on shifu is what I call North Country Shifu. I spin paper, often without the traditional moisture or pre-spinning, which yields a rough and slubby yarn. When woven these threads make a distinctive and beautiful surface. I use larger textiles for book covers, and weave smaller, four or more selvage shaped textiles for book pages. These are usually moro-jifu (shifu of both paper warp and weft) and are needle woven on simple looms. This book has two signatures of Arches text wove pages that were contact/pressure printed. 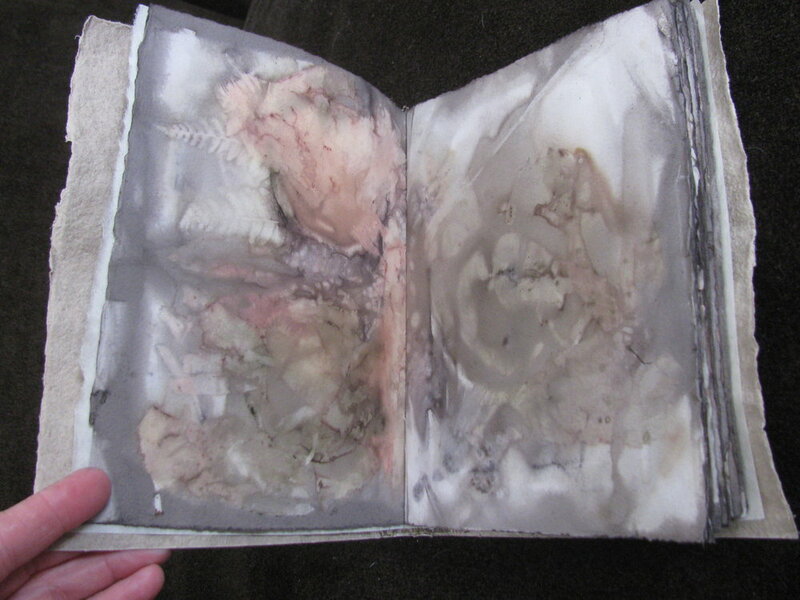 The pages have fold-outs and graphite drawings, so when you read this book it grows and dances. The cover is botanical pressure printed shifu (cotton warp, lokta weft) lined with printed flax case paper. It has botanically contact printed silk organdy endsheets, and an ostrich egg shell button on the spine of the stationers binding. This book is part of my Hortus Siccus project, and is in the collection of Baylor University Library. 12 coptic bound wooden board (poplar) books with pages of wordless contact printed Arches text wove, also a part of the Hortus Siccus project.